Intention: Provide materials which can help a technical or non-technical person judge changes in picture and sound quality without the use of meters. That phrase means what it says – if the test equipment isn’t scheduled for the auditorium for another 6 months, is there a way to tell if the the contrast and color display is degrading. These TIFF slides are experiments to answer this question, and supply tools if it is possible. Suggestions are welcome. If you have some ideas for changes, to fix mistakes or add nuance, let us know…likely we can change the master for the better or post another version. If you create something and would like it hosted on this site, please let us know. Read what the link says on the Creative Commons site. Generally, use them in your works, change as required. But please, 1) give attribution when use them either in commercial or non-commercial work, 2) provide a link to the original material and, 3) send a note to let us know what you changed. Striking, and only useful if you are looking for striking. But a lot of time was spent on it, so only say nice things, please. Each of these components will be made available in a kit, but for right now, here they are in one chart. There is a whole series to download here. These were developed to learn whether the black of the masking curtains and the typical vignette of the picture cause the illusion of luminance shift. 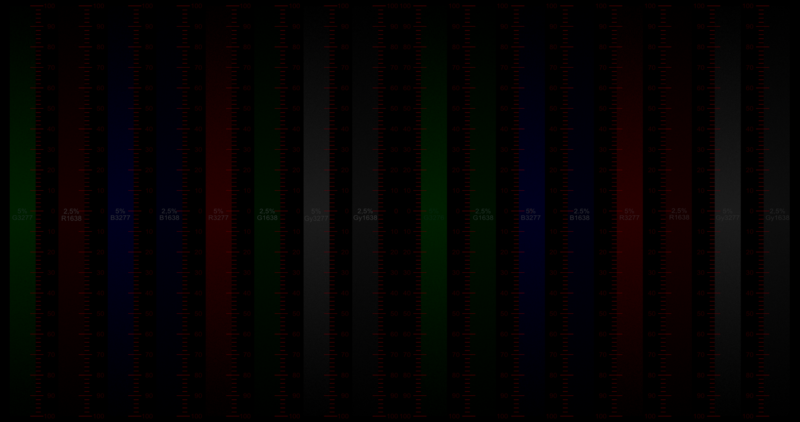 Black lines at every other position on the grid…and a variety of different primary and secondary backgrounds. 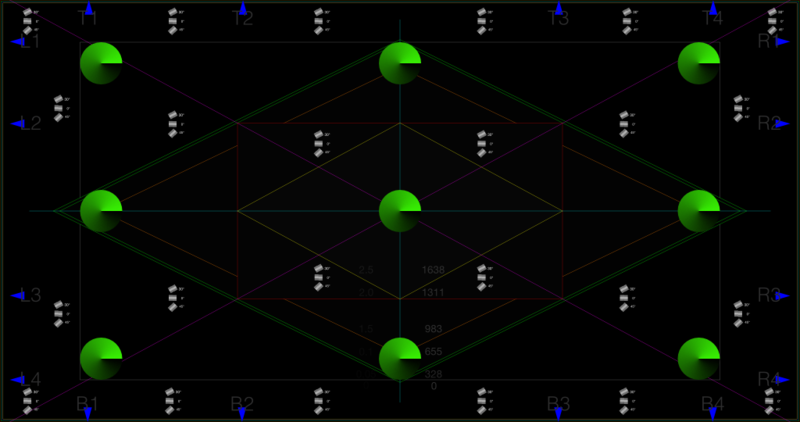 What is the difference to a projector or a LED wall between drawn black lines and backgrounds of colors…which actually fill in the alternate lines, right? 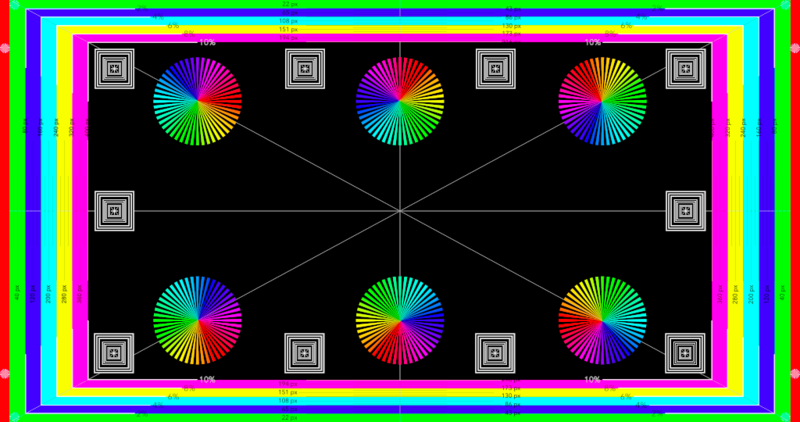 …and drawing the colors as the lines and letting the editing program put in the background…or no background at all. You too can find out with these plates. 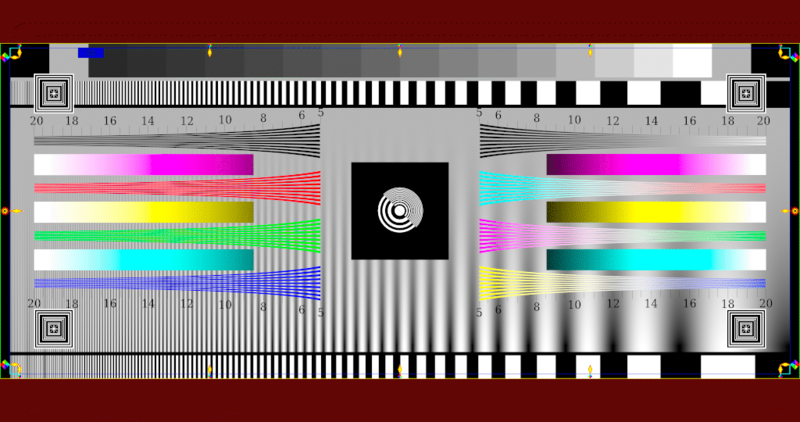 Primary and secondary color plates – Don’t need pictures of those here, do you? Just get them at the download site. Hmmm – What shall we call this? 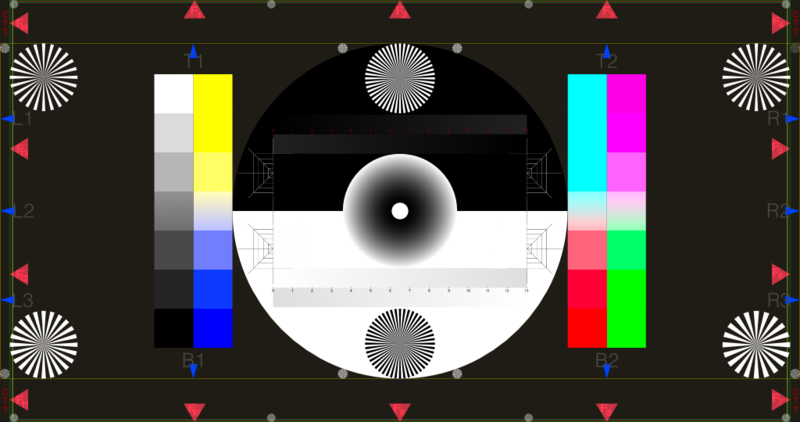 It is derived from the CST chart that marks off 2% rectangles to begin with, and a bunch of circles drawn at the proper 10% points…then it got botched up with moving the color wheels to align with the corner to corner lines which actually serve no purpose…ok, toss in some focus squares …that’ll distract them. 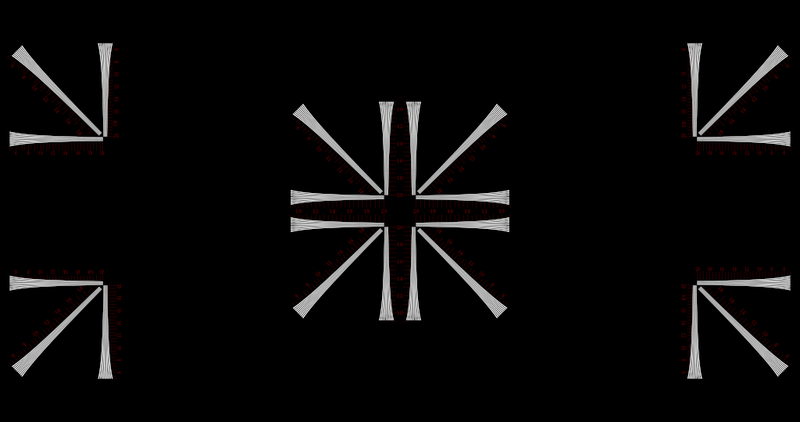 (This png is 709…get the real thing in 2020 and tell us how to make it better please. Hmmm – What shall we call this? 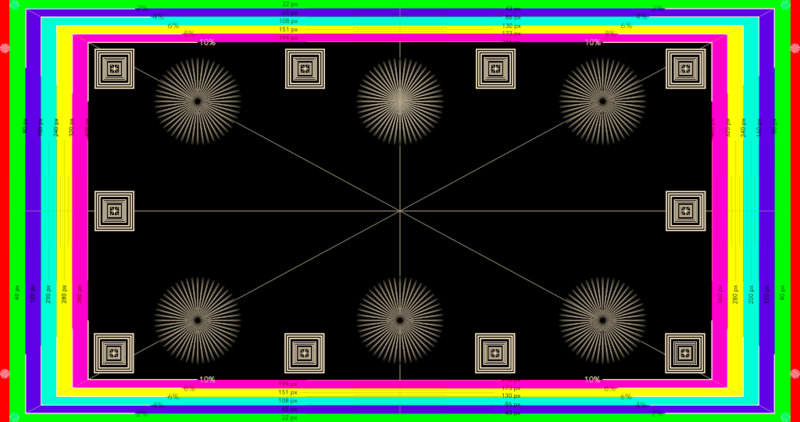 It was inspired by/is derived from, the CST chart that marks off 2% rectangles to begin with, and a bunch of circles drawn at the proper 10% points…then it got botched up with moving the color wheels to align with the corner to corner lines which actually serve no purpose…ok, toss in some focus squares …that’ll distract them. (This png is 709…get the real thing in 2020 and tell us how to make it better please. 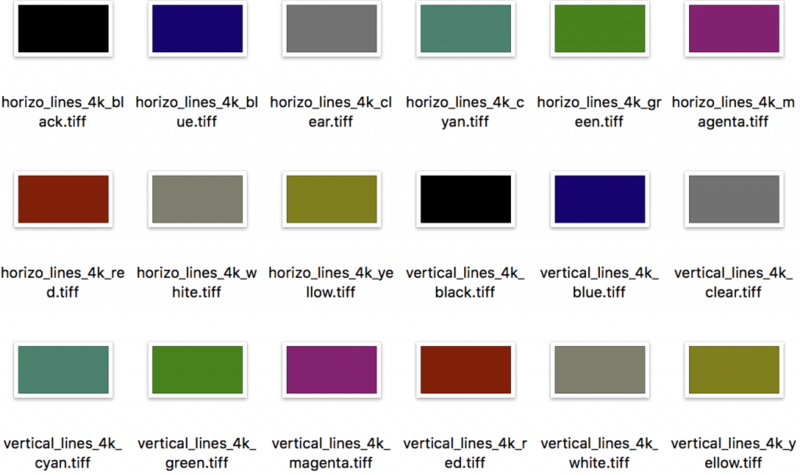 Several variations with several colors going from full saturation to dark or white …and grey level tests too. A distraction because I keep refining it. Now with MTF marks – hope they work…haven’t tested them yet. 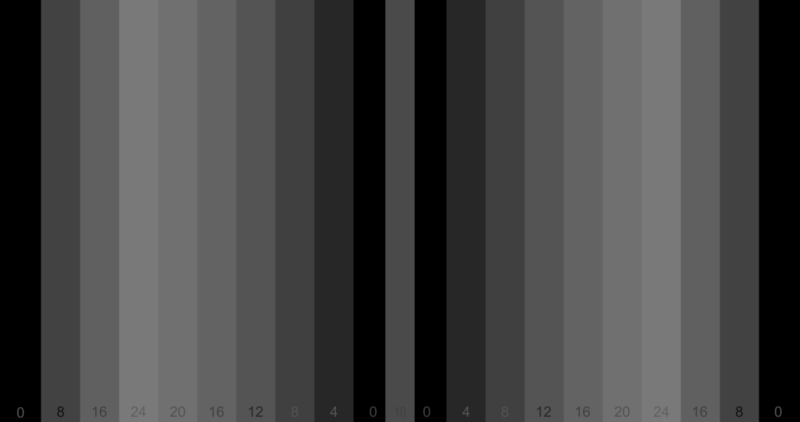 Dials for Contrast: 6%, 4.5%, 3%, 1.5% RGB and Greys, with and without tic marks. This idea is similar, but with the gradient from 6% to 0% (as well as 4.5% and 3% and 1.5% to 0) on a dial. 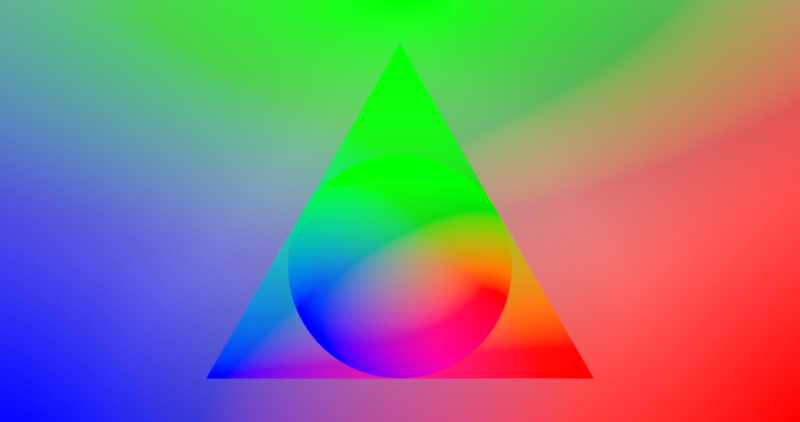 There is a version with a set of tic marks to note where the last point of seeable color is…and a version without. Why? Because it may be that one needs to spot the postition without the influence of the dial markings, then get the markings later. Experiment and report please. RGB and Greys. 2020. 4K and 16 bits of depth for each color. All to see if we can get a subjective objective. 8 TIFFs of Trumpets. The ability to watch as lines get closer together. There are many variations…there are numbers in there somewhere. Experiment and report please. RGB and Black. 2020. 4K and 16 bits of depth for each color. All to see if we can get a subjective objective. Circles and Stars and a few other things to stare at. And some fun while making the primaries turn into secondaries. Ya gotta love bluey yellow, no? The alternative TIFF uses outlines of the Siemens Stars for the center position, just to see what detail they hold. No idea if a 4K system can hold 48 spokes…let us know what you find please. RGB and Black. 2020. 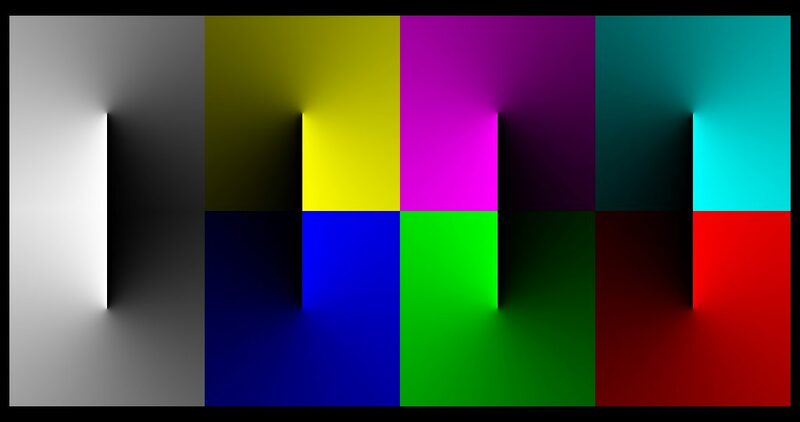 4K and 16 bits of depth for each color.